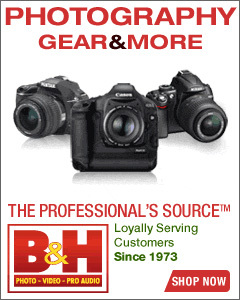 The Nikon D300s and Nikon D700 have a custom setting to enable high-speed flash sync – custom fucntion e1. However, you have the option of setting it to either 1/250 Auto FP, or 1/320 Auto FP. I’ve often been asked which is the preferable setting … and you know, I never quite knew either. 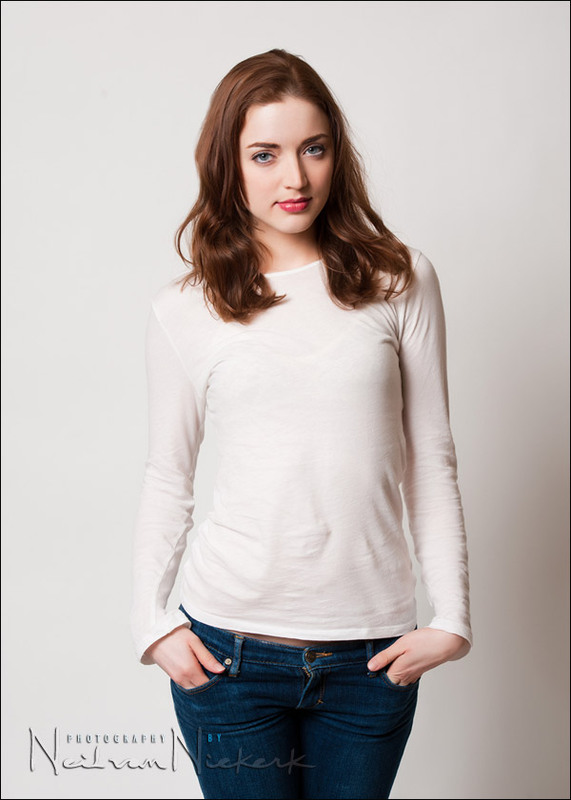 The only light source was a 60″ umbrella into which an SB-900 was bounced. All mounted on a light-stand, immediately to camera left. The slaved speedlight was then either triggered via an on-camera SB-900 with its own output disabled …. and then for a non-CLS comparison, the speedlight was also triggered by a PocketWizard Plus II unit. I set the slaved speedlight to maximum manual output. This way, if there is any reduction in the flash’s effective output, we will immediately notice. And then we have a favorite model, Anelisa, as a subject. Pretty much as we’d expect. The moment we go over maximum sync speed (1/250 in this case), into high-speed flash sync territory, then the flash’s output is dramatically reduced. For the D300s (or perhaps it was just this one particular copy of the camera), the flash’s output is ever so slightly reduced at 1/320th of a second. Not much. But what is noticeable, is that we are getting a distinct darkening to the left-hand edge of the frame. So with the D300s, if I had to choose between 1/250th or 1/320th Auto FP, then I’d go for the 1/250th setting. The increase in shutter speed is marginal compared to the image quality that is suffering due to uneven exposure. The same thing happens with the Nikon D700 when set to 1/320 Auto FP. The same thing happens with the Nikon D700, except that the darkening of the frame happens to the right-hand side of the vertical frame. In all four sequences, nothing is gained by setting the camera to 1/320 Auto FP. We can’t cheat the actual maximum flash sync speed of either camera. No wriggle room there. In fact, if we look at all four sequences, we will see a darkening of the edge of the frame even when we work at 1/250th, due to propagation delay. Set your Nikon D300s and D700 to 1/250 Auto FP, since there isn’t much to gain by going to 1/320 Auto FP. Also, if you’re working in a studio environment with older radio slaves, then keep to below maximum flash sync speed. 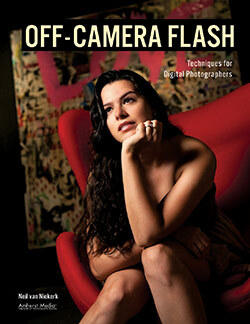 This will give you more even exposure from edge-to-edge, than you’d get if you worked at maximum flash sync speed. Thanks Neil for this clear explanation. Man, you put alot of work into it. The least I could do is to thankyou for this. Neil, here’s something that I’ve noticed happen with my d700 and 320fp using the new pocketwizards. Using the pw mini and flex I still get the darkening of the frame at 320. Hypersync enabled, 320 is the only shutter speed affected. Not 250 not 400, just 320. 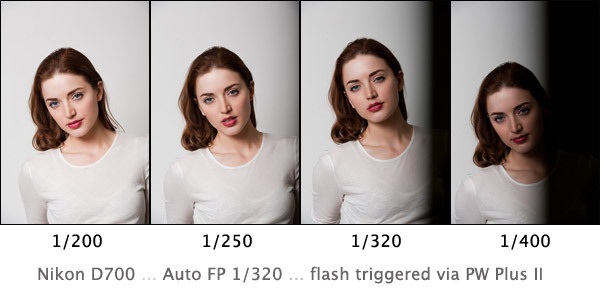 However, when using the 250fp I do not get darkening of the frame at 200, 250, 320, or 400. For hypersync to work, auto fp has to be enabled. So I’ve set up my d700 to be at auto fp 1/250. 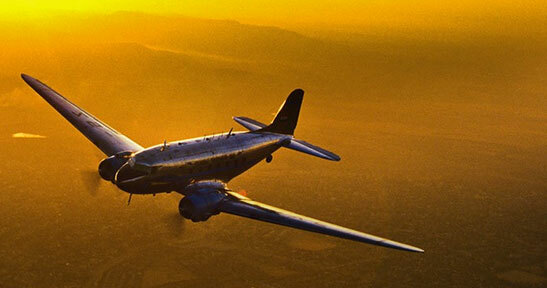 Nice article – what is the difference between ‘normal’ 1/250th and 1/250th (Auto FP)? 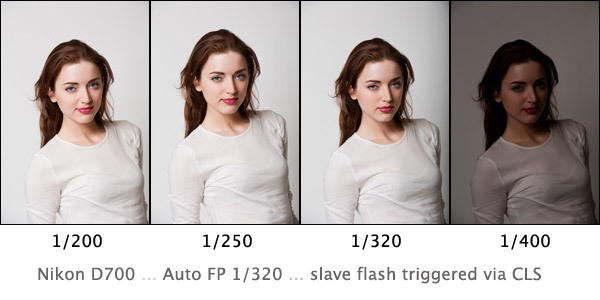 With normal 1/250 flash sync, you can’t go into high-speed flash sync territory. You’re limited to the max flash sync ceiling. Allen .. that was my assumption as well, looking at the position of how the shadow of the curtain progresses across the frame. Neil, could the D300/D700 left/right difference be due to one camera is on first-curtain sync and the other on second-curtain sync? Blake … now that you mention it .. you might be onto something here. It’s too late to check now though, since these two cameras were loaners, and they’ve gone back. Nope, it doesn’t show in the EXIF data whether normal or rear curtain flash sync was used. I double checked on the Nikon D3 now, and there is no difference in how the shadow of the curtain appears, between selecting first (normal) and rear curtain sync. On second though, rear curtain sync only has effect at slower shutter speeds. As you approach maximum flash sync, the difference in timing between first and second curtain flash sync starts to disappear. And at max flash sync, there really is no difference … since both the shutter curtains are open just perfectly for the flash exposure to take place, with minimal delay between the first curtain stopping its travel, and the second curtain just barely hasn’t started traveling yet. I was under the impression that the use of AUTO FP HSS was used while using Nikon’s CLS. The use of a PW Plus II breaks the chain of the CLS system and doesn’t allow the HSS go beyond the Auto FP 1/250 or 1/320. I thought that is why PW came out with the Flex TT5/Mini TT1 to maintain the HSS and i-TTL capabilities. I thought while using the on camera flash in command mode and firing the SB-900 remotely, you could achieve higher sync shutter speeds without the dreaded “black line of death”. I thought as long as you maintain the CLS chain, you can achieve maximum shutter speeds. Fred, you’re correct. 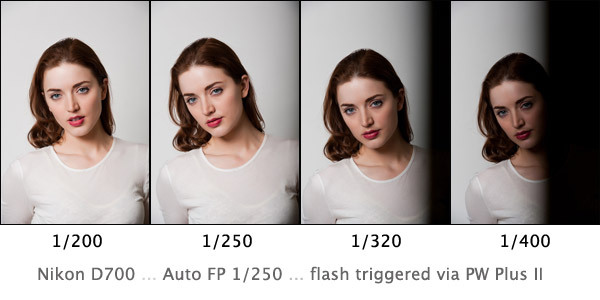 In using the older PocketWizards, we lose the wireless TTL control of the flash, and we lose high-speed flash sync. 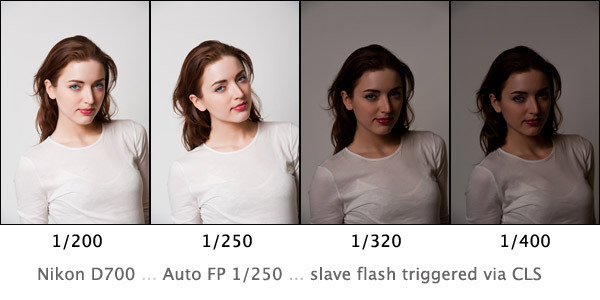 I merely added it as a double check whether the choice of Auto FP flash sync doesn’t affect that. And yes, you’re right in your summary about achieving higher shutter speeds with flash … the point of this article is to see what happens at the point when the camera and flash flips from the normal high-energy burst of light, to the rapid train of pulsed light that makes up the high-speed flash pulses. And what is shown here, is that there is a reduction in power at some point, because of the penalty paid for using high-speed flash sync. 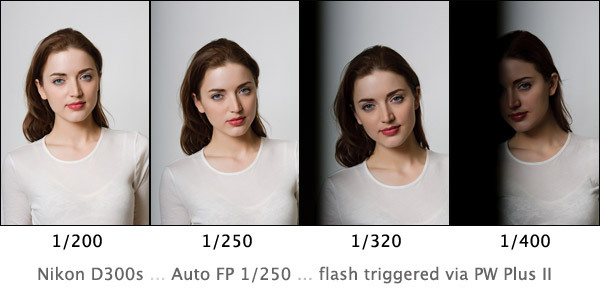 Even in going from 1/250 Auto FP to 1/320 Auto FP, there is a slight reduction in power of the flash. You can see this in that the 1/320 Auto FP images are marginally less bright than the 1/250th images. Thank you for the clarification Neil. I appreciate all your efforts in keeping us informed! Keep up the great work. Take care. It is strange that Nikon would even offer 1/320 Auto FP as an option, when the instruction manual for both cameras explicitly states in the specification page that the maximum sync speed is 1/250. Maybe Nikon thought nobody would notice the edge darkening at 1/320 using CLS. It is good that you were able to take some shots and show that 1/320 doesn’t help very much. 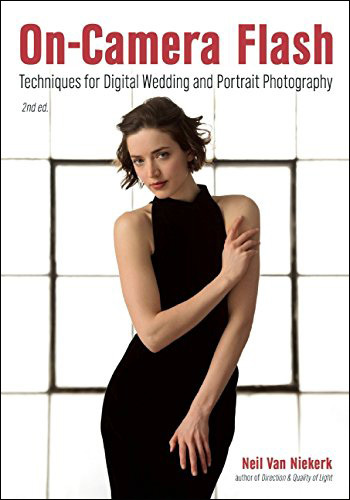 The darkening on the edges would rarely bother someone shooting portraits on location .. or any type of photography where the lighting on the very edges aren’t as important as it would be in studio photography. This means that on location, the 1/3rd stop gain in aperture you get from the 1/3rd stop higher shutter speed, is nearly offset by the loss in power. So there isn’t much to gain with 1/320 Auto FP, from what I can discern here. I guess it is in a way like the Canon 1D mk3 offering a max sync speed of 1/300 of a second. Nice round number which sounds much higher than 1/250, but is barely 1/6th stop faster than 1/250 … looks nice on the spec sheet, but doesn’t really have much practical benefit. 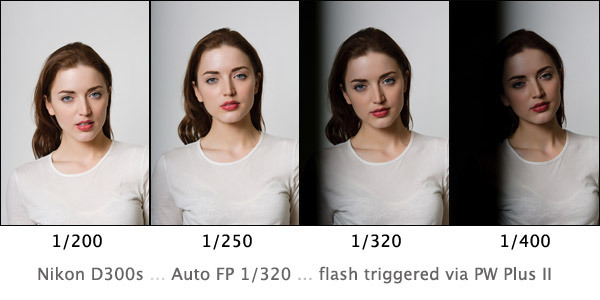 I too had wondered which of these FP settings was optimum for my D300… so this info was incredibly useful. Thank you! Using Cybersyncs (on 2 D700s and a D3) I get a very clean frame at 1/320, and at 1/400 I get less banding than your 1/320 shows, so clearly your Plus IIs have some lag that is causing inefficiency. It stands to reason the new PW models with hypersync adjustments would give you at least that 1/3 stop efficiency boost. 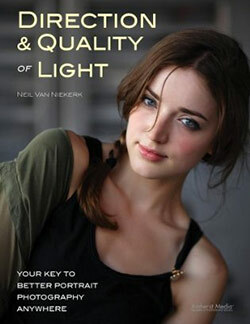 Nikon Europe states that the 1/320th setting is there to allow on-camera flash to be used beyond regular sync speed. 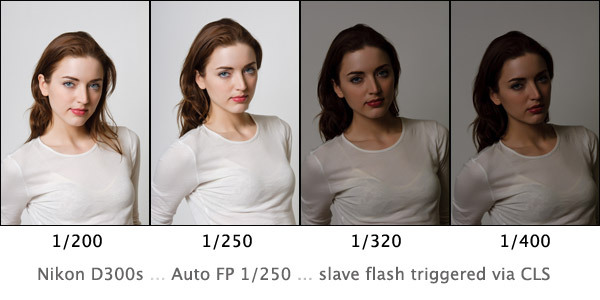 Since they can’t use FP sync, there is a distinct advantage for on camera flash users (perhaps using for fill flash out doors). Ed, that most certainly is the motive behind this innovation. But as seen here, there is a slight drop-off in the flash’s reach, and uneven exposure (although this will most likely not be a problem on location) … so ultimately, there isn’t that big of an advantage to using 1/320 Auto FP. I love the way that you’re so inquisitive and that you are continually experimenting and researching things reading your blog always inspires me. I like this post it is very informative and I too have noticed the same using my Nikon D700 but all is not lost. There is a way of using the Nikon D700 and also some of the other Nikon cameras above 1/250 of a second and still get clean photographs. I don’t know if you’ve heard of it yet but there is a hack for Nikon cameras that allows you to shoot clean photographs up to 1/1600 of a second and up to 1/8000 of a second with a very slight line at the bottom of the photo. This is how you work the hack for the D700 connect your pocket wizard to the Flash as you normally would then connect the other pocket wizard to the PC sync socket of the camera as you would normally then put a speed light in the hot shoe of the camera turn all items on as you would normally do set the Flash connected to the pocket wizard to full power then you need to put the speed light that is on the camera into master mode and set the master not to fire set camera to auto FP mode and then set the aperture and then the shutter speed to 1/400 of a second then take a shot. The first shot may come out with a line on it then take another shot this shot should be perfect (for some reason it sometimes takes one-shot to calibrate.) . You can now shoot between 1/400 of a second and 1/1600 of a second with clean frames. 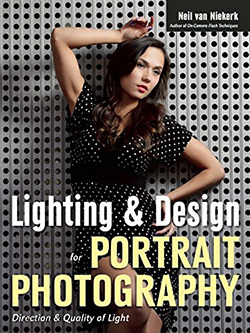 •	You must use full power on your strobe as this has the longest Flash duration. •	You get black line at 1/320 and 1/250 of a second this seems to be the same problem as pocket wizard has with their Flex tt5 and tt1 that on the jump from normal sync to high-speed sync seems to have a glitch with the Nikon cameras. •	From 1/2000 of a second to 1 8000 of a second you get a 5 mm black line at the bottom of the frame about the same as 1/320 of a second. •	The Flash output reduces by about two and half stops between 1/250th and 1/1600 of a second and a further stop between 1/1600 of a second to 1/8000 of a second. Jason .. this works! Incredible. Where did you learn of this hack? What I find interesting with that hack, is that it doesn’t just rely on the decay time (T.1) of the light pulse, as in this example where I did something similar with the Quantum flash. With that example, I just had to be at a high shutter speed, with the flash at full power. With this hack you mention, the camera needs that speedlight in the hot-shoet, and that speedlight needs to be in Master mode. I think I made bit of an error on the post above. When I said (you need to use one Nikon dedicated Flash that can be set as a CLS master) I think I should of said you need to use one Nikon dedicated Flash that is capable of. I TTL FP Flash sync. As you don’t have to put the Flash into master mode for this to work, you can use it with normal. ITTL/ FP or manual FP Flash sync as well. I use in master mode and set not to fire so the on camera Flash does not leave a catch light in the eyes and I also use the creative lighting system in conjunction with this method they play very nicely together when you know how to use them. I came across some information about this hack in a post on the flicker strobist site (http://www.flickr.com/groups/strobist/discuss/72157604362003933/) and then just played around with it until I found a system that works for me . I tried it on a D3. How were you able to trigger the camera and the flashes with the RF602 triggers–did you connect the TX unit via the pc-sync port of the flash or via the pc-sync port of the camera? I’m trying to figure out how you did it so I can get the right cables. I’m trying to create a low-key portrait using the D300 and the SB700. The SB is set at 45degrees on remote. The D300 is set to Commander mode with the pop-up flash set to (–) and the the A group set to 1/1 or full. First, I shoot at f/7.1, 1/200 to locate the absence of ambient light. I then flip open the pop-up in order to get the SB to fire. But, the pop-fires regardless and the image is barely visible regardless of the SB firing at full. The SB700 is no more than three feet from the subject. What am I doing wrong? How do I disable the pop-up? Why doesn’t the flash give me a stronly lit portrait? The pop-up flash *will* fire. That’s how it talks to the remote / Slave flashes. So you will see the pop-up flash fire, regardless of whether the pop-up flash’s output is enabled or not. If you disable the pop-up flash’s output, it won’t add (much) to the overall exposure. The actual exposure will be left to the remote / Slave flashes. 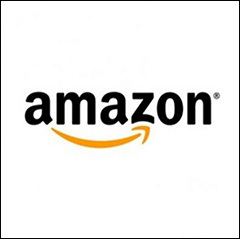 Do you have the remote flash set to Slave via the CLS system? 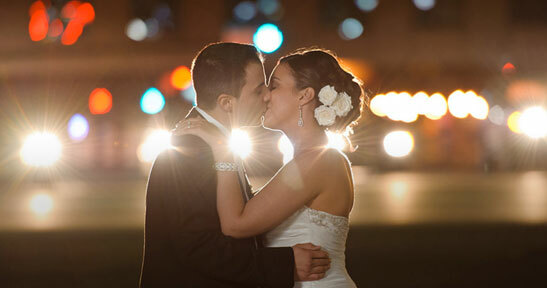 Or how are the remote flashes triggered? I am curious what your exposure mode was set on during these tests. In the Nikon manual for the D700 it says the camera needs to be in exposure mode P or A for the auto FP high-speed sync to be activated. Did you find this true, or were you able to shoot on M (manual exposure mode)? Sara, Auto FP most definitely does work in Manual exposure mode.